In this comprehensive guide you’ll learn how to take your trade show marketing to the next level. From pre-show to post-show, we’ll walk you through establishing goals and a budget, creating your communications strategy, planning your booth, creating an event schedule, networking, leveraging social media, following up with leads and measuring your success post-show. 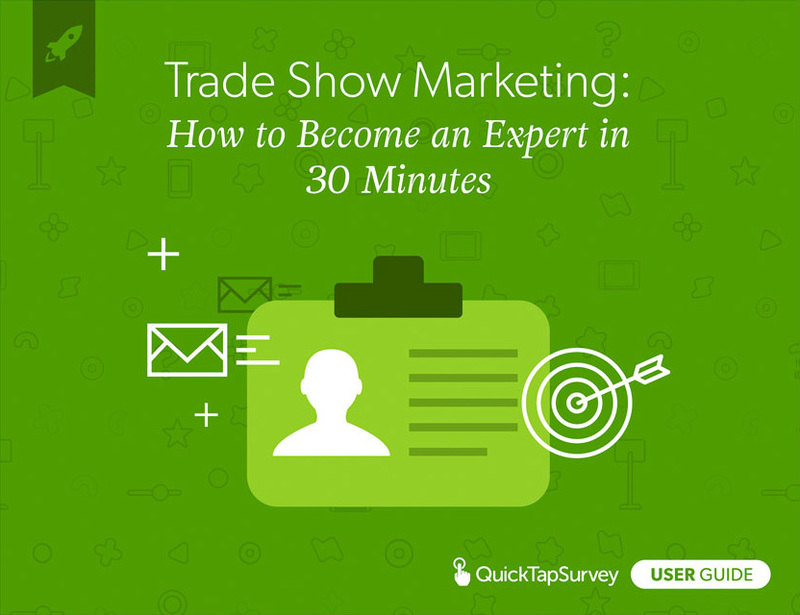 Become a trade show expert in just 30 minutes! Pre-show planning is the most complex of all and is the number one determinant of trade show success. This section touches upon the three critical areas of pre-show planning once you have selected a show. Pages 2-10 take you through the process creating a trade show plan. By the end of this section, you will have learned how to develop a marketing message and an outreach program. The very first thing you’ll need to do is set your goals - this is the most crucial element and the most often overlooked part of the planning process. Establishing clear goals will create internal alignment on what success looks like, dictate your marketing plan, and be the backbone of your budget. Trade shows can achieve many different things. But what is the main reason you’re going? What is the one thing you want to achieve by exhibiting? Setting quantifiable primary and secondary goals will help you maintain focus, as well as inform your exhibit design and event communications. Everything you decide from this point forward should relate to, and be evaluated against the goals you establish at this initial stage. When you define your goals they should be specific, measurable and time-bound. Example of a poorly defined brand awareness goal: Increase brand awareness and meet potential customers. Example of a well-defined brand awareness goal: Give away 2000 swag items, generate 20 qualified leads and follow up with them within 3 days. Begin with a brainstorming session. If you have multiple teams involved, this is the time to group everyone together and pick out key members as part of your trade show team. Once you establish what you want to achieve, the next step is to define what success looks like (i.e. your objective). Determine and then gain internal alignment on clearly measurable outcomes. Be specific. How many people do you want each of your sales reps to talk to? How many leads do you want at the end of each day? Just remember objectives would differ based on your goals. Ex: For lead gen, you would measure number of demonstrations, and for branding, you would measure overall impact. Once you’ve determined your goals and objectives,make sure to communicate them to all stakeholders both internally and externally. ROI is likely (and should be) one of your objectives regardless of your goal, however, how you calculate it will depend on what objective you are trying to achieve. Calculating the value of your objectives is critical so make sure that you have alignment on how you are calculating it, as well as what the expectations are. After you agree on your trade show goals and objectives, it’s time to break down the costs associated with achieving them. No matter the size of the trade show, many of the expenses you are going to incur are going to be unavoidable, but you can prioritize your spending according to your overall objectives. Aside from floor space, the biggest expense you are going to incur (and where you can save) is booth design and build. What technology is needed? Is a private meeting space required? Do you really need to ship furniture across states, or will renting or shopping at a local store work just as well? Are the exhibit elements actually meeting marketing objectives or are they mere gimmicks? Knowing the type of visitor engagement you want will allow you to design a cost-effective booth that will maximize your marketing message. Generally speaking, you can estimate the total cost of exhibiting based on the cost of the exhibit space. If your booth at a particular show is going to cost $7,000 then your total trade show budget can be estimated by multiplying that cost by three, so $21,000 for that show. To manage your budget, create a spreadsheet with the major categories and line items listed under each. The spreadsheet should include budget versus actual and indicate the variance. Here’s a FREE one you an use. Brand awareness is the number one marketing related objective for exhibitors. 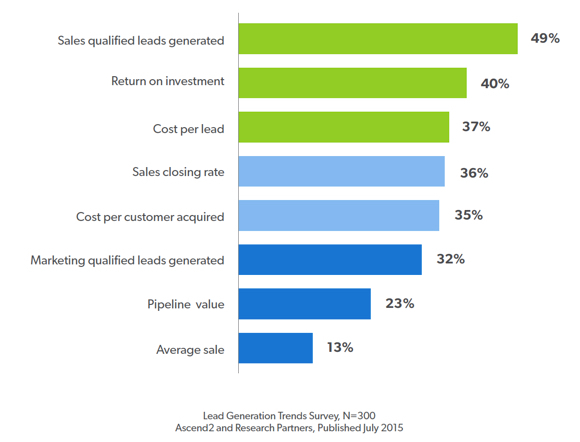 Lead generation and relationship building are the top sales related objectives. Don’t neglect to consider indirect expenses. For example, lost productivity around time away from the office. Events often offer early registration, which can save on the cost per square foot. The goals and objectives you set earlier will drive your main marketing message. Are you exhibiting to boost brand awareness, make customer connections or close deals? Your answers will determine your marketing tactics. Ex: If your main goal is to present your product to 15 partners, you will need to target them before the trade show opens in order to set up meetings during the show. In this case, booth traffic and lead capture will not matter as much, and should not be the focus of your efforts. 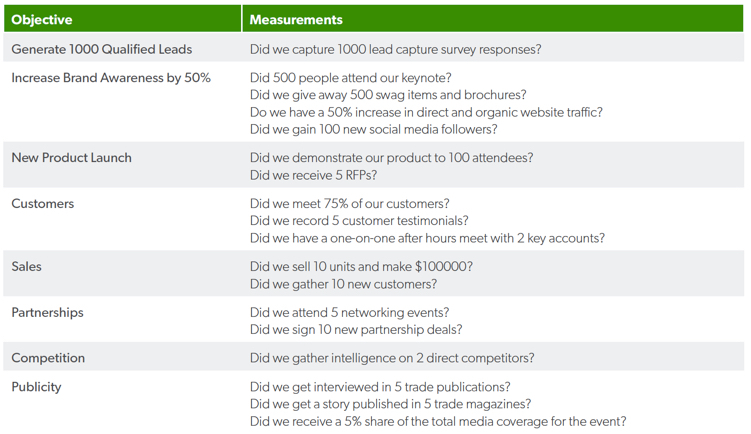 Use the ideas in the table below to align your marketing plan to your goals. Everything you do - from booth design to graphics to post-show communications should stay focused on the one or two key messages you want to communicate. Unless your goal is to sell physical product, for a majority of companies, especially B2B, revenue payoff will only come from post-show sales. For those who are already in your sales funnel or that you’ve made a connection with before, getting in touch before the show can help you make a connection while you are there. For new prospects, using event hashtags on social media, sharing news about your booth, contests and events on your blog and building buzz before you go can help you generate interest and ensure that a percentage of attendees will actively seek you out. It’s crucial you know whom to meet and what kind of business you need to do with them - depending on your goals sometimes this could just be one person from one account. Ask the show organizers about receiving (or purchasing) the attendee registration list. Extract potential high-value visitors from among the attendee list and invite them to longer meetings, private get togethers, dinners and after-parties. You’ll want to start building a relationship with them early on, so your brand is top of mind. Take the attendee list one step further and create a lookalike campaign on Facebook which is shown to average a 5% CTR. Depending on your goals, pre-show marketing relies heavily on email drip campaigns. Each piece of communication (and follow up) will need to be targeted to the specific audience (Ex: existing customers vs. registered attendees), mapped out, written and scheduled in advance. Landing pages are commonly used as a way for people to get specific show related offers and book meetings with you beforehand. They can also be used creatively as a way for people to pre-register for a contest. Lastly, develop your social media messaging and monitor the event hashtags to create targeted lists for outreach. Pre-sell campaign goals (ex: pre-qualifying x # of prospects, setting up x # of appointments) tie back to your overall trade show goals and objectives and will be the basis for all your marketing materials. Before you launch a campaign, be it via email or direct mail, you should think about what you would like to achieve beforehand: would you like to direct prospects to your booth? Or would you like to schedule a 1:1 meeting? Campaigns should launch at least three months before the show as 70% of attendees decide which booths to visit before the show opens. If you have a booth theme, carry that through in your marketing materials to generate intrigue and curiosity. Many marketers assume direct mail is dead when in fact, it remains a great way to connect with your prospects. An exhibitor we know used direct mail to send prospects an oversized antique key with a treasure map to their booth. While every key looked identical, only a lucky few could unlock a treasure chest displayed at their booth. On the day of the show, qualified attendees, giant keys in hand, could be seen all over the trade show floor. Not only was it an amazing booth traffic strategy, the press absolutely ate it up. You too can order oversized keys (and far more unusual items) online from Alibaba for as low as 10¢ a piece if you do it early enough. A good trade show promotional plan will contain strategic pre-show activities to pre-sell prospects before they arrive, at-show activities to hold their attention during the show, and post-show tactics to successfully follow-up and move them through the pipeline after the event has concluded. getting on the attendee email marketing campaign. Most shows will have an area for visiting editors and journalists so make sure you display around 30-40 press kits in the press room. If there is a new products pavilion, paying to display here is well worth it, as is entering various newcomer or product category awards, if you fall into that category. Official show guides are well distributed, and attendees will typically hold onto them throughout the year, so an ad or sponsored feature here (combined with an exclusive promo) is good value for money. If you are conducting demos, speaking sessions or recording testimonials, then use social media to complement your at-show activities. If generating leads and opportunities is one of your goals, it’s best to cast your net as wide as possible. Plan to hit prospects from every imaginable angle. After all, a bigger pool of people means more potential leads. Blast your customers and contacts about the show. Some companies even pay for passes and other extras to grab the attention of their biggest prospects. If your company is hosting a speaking session or sponsoring a hospitality event, you should have invitations ready at your booth for pre-qualified prospects. Having invitations waiting at the booth is a better strategy than mailing them out in advance. Generally speaking, the more visitors or meetings you can confirm beforehand, the better. If you are launching an email campaign recipients should be taken to a landing page containing all the information they will need about the show, your exhibit and any show specials you are offering. They should also be able to book appointments at your booth. To make an impression on high-value prospects that you want longer discussions with, you’ll have to think beyond the trade show floor. Even before you have confirmed appointments you should make breakfast reservations at the conference hotel, and dinner reservations at city hot spots well in advance as these will get booked up fast. In the last few days before the conference, send out a final personalized email to remind people of the show and confirm appointments. It’s nice to have some last minute surprises you can share such as a complimentary visitors parking pass or invitation to an insider event. This can be your final push for some valuable face time with targeted prospects. throughout the show, particularly the press. 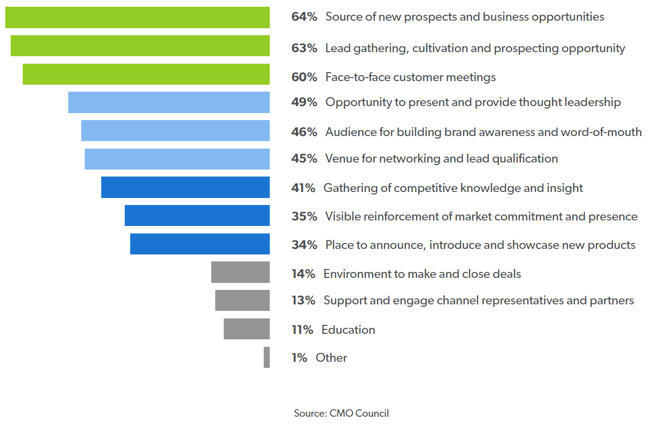 Marketers seriously underutilize pre-show promotions, devoting only 5% of their event budgets to it. Be a speaker, don’t just exhibit. Your customers have more power than you. If you’re paying for a speaking spot, get your customer to speak on your behalf. The value of a good booth location cannot be overstated. As a general rule, you’ll want to get your booth in a high traffic area. Exhibit hall entrances and exits can come across as overly crowded, but being here will increase the chances of having a busy booth due to its sheer visibility. Similarly, being positioned close to entrances off the food and drink areas and washrooms is a good idea, as is the high-traffic nature of corners, aisle intersections and outer-perimeter locations. You should reserve your place early if you want to score a prime spot. If you have trouble deciding, contact the organizers and ask about traffic flow for that particular trade show from previous years. Find out where your bigger competitors are located, as you may (or may not) decide to avoid that area. If you’re a little fish in a big pond, get positioned next to a big brand or central attraction to capitalize on that traffic. Approximately 90 days before the trade show opens, you will receive an Exhibitor Manual from the show organizers. The Exhibitor Manual contains information such as set-up/tear-down instructions, move-in/move-out times, vendor order forms, booth display regulations, health and safety information, shipping and transportation schedules, who to call in the case of an emergency and much, much more. Sticking to the deadlines and instructions in the Exhibitor Manual will save you money and countless hours of worrying when faced with an obstacle (and there will be many). The Exhibitor Manual is usually 50+ pages, so you’ll want to make an executive summary with everything that’s relevant to you, and print out a copy for each stakeholder. Create a game plan that ensures every aspect of the booth, from set-up to take-down, is covered. Distinguish between all the exhibit accessories you have ordered on-site, ones you have shipped in advance and those you have to hand carry with you. Create a shared group calendar with all the action items and order deadlines in the Exhibitor Manual. Because everyone attending can see it, it will help improve accountability and productivity. Determine which services you will need on-site and submit vendor forms on time. On-site services include everything from internet, electricity and plumbing to plant rentals and photography services. A common occurrence at trade shows is table after table of booths that all look alike. However, there are always a few that stand out from the sameness of all the others—booths that you remember. What made these booths special? True success comes from finding a hook that is aligned with your objectives. Are you trying to make sales, make connections or just build your brand? Each of these requires a little something different from your exhibit design. Ex: If brand awareness is your objective you’ll want to maximize foot traffic, so the focal point of your exhibit will be things that attract attention such as bold graphics, revolving signage, dancing mascots, mobile charging stations, etc. Don’t forget to factor in lineups and desired traffic flow when determining layout. You can usually rent a modular booth at a fraction of the cost of purchasing one. It also weighs 60% less than traditional custom exhibits, saving you on the cost of drayage (cost of transporting your exhibit). Make rental vs. buying decisions and material choices based on the number of times you plan on using the same booth. The rule of thumb is that for each three rentals you will have paid for the cost of a new booth. Your decision should factor in costs related to exhibit maintenance and insurance, shipping and storage, graphics updates and general wear and tear. Fabric graphics, foam flooring and modular exhibits are all lightweight and can save on the cost of drayage. For graphics, the average lifetime is one year and for a display, it’s five. Remember to pack these backups: 1) Toolkit with duct tape, hammer, wrench, screwdrivers and a set of allen keys. 2) Cleaning kit with paper towels, wipes, gloves and dust-trapping cloths like Swiffer. 3) Backup cables and chargers. Backups should be concealed from the attendees view. Save the address and hours of the nearest Home Depot and IKEA locations. Buying or shipping will always cost less than renting items from a show vendor. Don’t forget to include re-packing instructions. This may not be the most show-stopping tip, but it’s completely necessary. Without insurance, you could be on the hook for accidents like slips and falls, allergic reactions and malfunctions like falling displays which are outside of your control. It not only protects you and your business, but it also protects the people coming to your booth. You will need a general liability insurance policy, typically to the minimum value of $1,000,000. Check with your insurance company to make certain you are covered for everything you need, especially when crossing international borders. Managing your people and your space is crucial because 85% of an exhibitors success lies in the performance of the booth staff. Every person going should have a role to play (ex: greeter, demonstrator) and specific tasks they need to perform. Prepare to have at least two staffers for every 100 sq ft of exhibit space and take the time to train everyone involved on the elevator pitch as well as the sales script so that they are prepared to deliver a consistent, polished message, and your booth looks clean and well maintained at all times. Staff should know the names and faces on your hit list (high-value prospects, senior reporters, etc.) and who to alert if they show up. Role-playing various staff/visitor interactions will avoid unnecessary risks and is the number one key to preparedness. Let your best customer speak. If a happy customer drops by, train booth staff to interview and film a customer testimonial and stream it live through the monitors for a big impact. Consider staffing your exhibit with a mix of employees, customers and subject matter experts for the best impact. 86% of trade show attendees will keep swag for at least seven months. While a branded keychain, pen or USB are all practical and useful giveaway items, they’re also completely overdone and unlikely to increase the draw of your booth to those passing by. Select two kinds of giveaways - one that is free for all, and a second higher-valued item, for qualified prospects. If you’re wondering how many items you should order, the general rule of thumb is to use the size of the show to determine numbers. For large shows over 2000 attendees, plan for 25% to get a giveaway, and for smaller shows, this number increases to 75%. Prepare to raffle something at the booth should you run out of items. Giveaway idea 1: Attendees get hungry, and the more their minds are focused on their next meal or drink, the less attention they’ll give you. The delicious, enticing smells of coffee and popcorn will draw in the crowds. Giveaway idea 2: Offer something wearable and turn it into a game. Ex: Those who wear your bracelet or armband all day are entered into a draw to win a big prize. Great for when you want to turn attendees into walking adverts. Giveaway idea 3: Tote bags, but not the thin, cheap kind. Big, bright, branded bags with comfortable straps are great for carrying other people’s swag around. Distribute them freely and abundantly. You want everyone to carry one. Whatever your giveaway, just don’t over promote your brand on the item. A little subtlety will make all the difference between someone keeping your item or discarding it. If lead generation is one of your goals, you should ditch paper forms and business card fish bowls altogether because they just don’t give you the level of detail you need to follow up properly. The only reliable choices are badge scanners and lead capture apps. Badge scanners are heavily promoted by the organizer. Approximately one week after the show ends, you will receive an Excel sheet with the attendees’ badge information - perfectly sufficient for some, but lost opportunities for others. If lead qualification and timely follow-up is important to you, then a lead capture app that connects directly to your CRM is the obvious choice. It will also cost you a tenth of the price of one badge scanning device. Before you invest in a badge scanner, ask whether every single contact scanned will include the person’s email and phone number (usually optional fields for attendees when registering). iPad kiosks are popular at trade shows because of their visual appeal, branding capabilities and inexpensive price tag. They don’t need to be manned either, so while you are chatting with one lead, you can direct another to the kiosk. Create added excitement in your booth by combining lead capture with something fun like a prize wheel, trivia quiz or scratch-to-win giveaway. Determine your post-show lead scoring and follow-up plans in advance. Average drayage rates have increased 488% from 1982 to 2010. You’ll want to stay at the hotel associated with the trade show for the added networking opportunities it presents. To minimize set-up and tear-down labor costs, number your shipping crates according to content and attach a floor plan diagram with booth layout, electrical markings and repacking instructions. 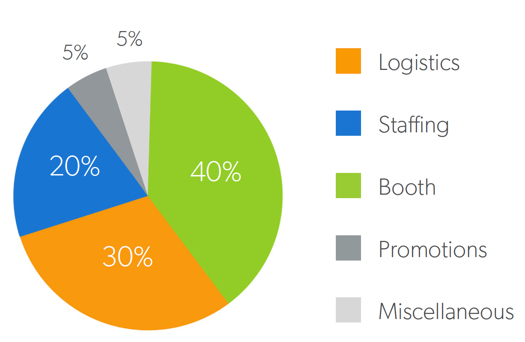 What role do trade shows and events play in your overall marketing mix? At-show activities bring to fruition all the hard work and planning you have done during the pre-show stage. This section touches upon the three main activities required to maximize your booth investment. By the end of it, you will have learned how to schedule each day, make great connections, and get the most out of social media. Daily check-ins raise the level of accountability and focus and keeps everyone on the team engaged and happy to work the show. They also help you separate the signal from the noise and predict a likely outcome in terms of ROI. The daily huddle is probably the single most effective meeting that you can have with your booth staff. Revisiting your trade show objectives early in the day, in a relaxed setting will ensure that the entire team is on the same page and focused on the same goals throughout the day. Shoutouts to team members and sharing positive stories remind everyone on the team of how valuable they are and are a powerful motivator to do better and achieve more. Communicating about the previous day’s events and sharing results such as number of leads captured can serve as a platform for additional improvements, scripting and role changes if required. A good daily huddle format includes 1) Personal Victories - Previous day’s Wins 2) Performance Metrics - Objectives and Targets 3) Stucks - Issues Blocking Accomplishments & Ways to Overcome. Whatever your trade show objectives, a nightly review of the day’s accomplishments will help you monitor outcomes and take the necessary measures to improvise before it’s too late. If your trade show event goals included lead generation, and you used a mobile lead capture app to capture them, you will be able to review both the quantity and quality of your leads at the end of each day (or in real time if you have wifi). Leads should sync to your CRM and be scored, prioritized and assigned to specific people for fast follow-up while you’re at the show. Follow-up begins before the show ends. The faster you distribute leads, the more motivated your sales people will be, and the more your business will stand out from the competition. While it might be a bit early to determine ROI in full, especially if you are B2B, use the data you already have to determine if the show was a right fit for your company. Calculating projected ROI is important at this stage because most trade shows sell their booths on a first come first serve basis. Show organizers will give you the option to book next year’s space during the current show, and knowing projected ROI will justify this decision. As a general rule, if you’re spending more on cost-per-lead than you’re making back, then it is not worth returning to the show. Cost per lead is the cost for the show divided by number of leads. Other crucial ROI metrics include social media reach, press mentions, direct website traffic and branded organic search. Staff should know the names and faces on your hit list (high value prospects, senior reporters etc) and who to alert if they show up. You will meet hundreds of people at any given trade show. Don’t trust yourself to remember everything. Make a grading system for remembering people and use that system for the entire show. Be prepared to talk a lot, and listen even more. Depending on how many people are staffing your booth, at least one of you should spend a significant portion of the day circulating the floor and getting the most out of the trade show calendar. By this we mean attend the panel discussions, workshops and seminars, scope out the competition and be interested in learning about your fellow exhibitors and the latest trends in your industry. Ask yourself: Is there something clever someone is doing that we can do too? Can we double our sales opportunities by trading leads with brands selling complementary products? Have our customer’s biggest triggers and pain points changed? How does their display and location compare to yours? Are they introducing a new product or service? How do their brochures and sell-sheets compare to yours? What promotional items and tactics are they using? Are they sponsoring workshops or hospitality events? How are their staff organized? What is the mood at their booth? What press are they receiving? Will they attend the same show next year? Speak to as many people as you can while waiting in food, taxi, restroom and elevator lines. You never know who will turn out to be a great contact. Similar to the attendee registration list, show organizers will also have a media list that you should have contacted as part of your pre-show activities. Make sure you arrange all interviews at your booth as the optics are good crowd pleasers. If you didn’t arrange any interviews beforehand, now is the time to work the press room, where the reporters hang out. Give them something worth their while like news, statistics, survey results and case studies. For each of these, you’ll want to give them real numbers or actual industry scoops (even if it’s off the record) as you will make a much bigger impression that way. Also be prepared to answer how your product or solution is different from everyone else’s, in a way that’s different from everyone else. A good way to spot a reporter from afar is to look at the color of their registration badge. Typically attendees’ badges are blue, exhibitors red and press green. Prepare to schedule your press release mid-way during the show and have a link to an online press kit in case you run out of printouts. After parties, awards galas and black tie events are the perfect backdrop for unlimited networking. These ticketed events are designed to bring together the who’s who of your industry. This means an opportunity for you to meet senior executives (and reporters) that were off limits on the trade show floor. The important thing here is to have goals and be strategic. Check out the guest list beforehand and know whom to target and what to pitch, as you would for any other event. Hitlist aside, there are going to be companies you’ve never heard of and whose business you need, so be prepared to circulate the entire room and talk to as many people as you can. Think of it as the business equivalent of speed dating. The more exclusive the party, the more important it is to attend. Don’t be afraid to approach people who you feel are out of your league - it’s what these social interactions were made for. If you’re attending with a colleague stick to a divide and conquer strategy. Use those restaurant reservations you made earlier to make a big impression on key accounts and high-value customers. The agenda for these meets are not to discuss invoices and renewals. It’s for you to become friends with the people you interact with and form a deeper personal connection that will last beyond the trade show. Ask about their city, school, family and hobbies outside of work. Make notes to remember them. You’ll know exactly what to get them the next time you want incentivize them. Aim for at least one social interaction with your customers, partners, suppliers and the press. 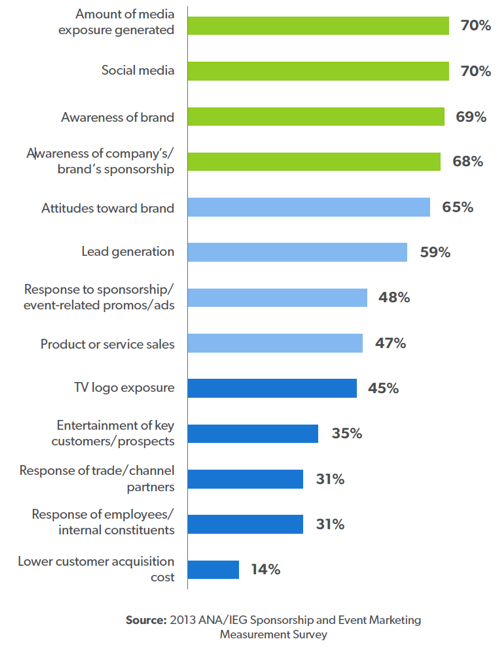 88% participate in trade shows to raise awareness of the company and its brand. Optimize your networking. If you’re attending with a colleague stick to a divide and conquer strategy. Fill your schedule. Maximize your relationship-building time by attending activities before, during, and after the show. Social media is a powerful, cost-effective way to maximize your presence during the show and continue engagement long after it’s over. For best results have a person dedicated to content development onsite. Own the event. Think beyond your booth number and instead focus on becoming a valuable resource by providing total coverage of the event. Is the parking on level 2 now closed? Tweet that information. Know who makes the best Negroni cocktail in town? Share it. Is there a LinkedIn group for the show? Create one. Use InMail to invite the organizer, exhibitors, speakers and attendees - they are all invested in knowing what is going on. Additionally, this is your opportunity to bring the show to customers and prospects who can’t be there. Invest in a monitoring tool to follow hashtags, listen to conversations and be an active participant. Look to friend show attendees, fellow exhibitors, and journalists who are looking for a story. Have a goal and prepare a script for each target audience you want to engage with. If brand awareness is a goal, then social media contests centered around user-generated content is a solid strategy to stand out from a sea of exhibitors. The selfie is a cultural staple that’s not going anywhere. Ask people to tweet out a selfie from your booth to win a special prize. Drive booth traffic by making announcements such as: “The first 20 people who visit our booth in the next 20 minutes receive a prize”. To gain more fans and followers, create a competition that involves retweets and shares. Give people lots of chances to win and announce winners regularly to build momentum and tap into the viral nature of the medium. Always use the big four - Twitter, Facebook, LinkedIn and Instagram - for the widest possible reach. Trade shows are a great place to create shareable content. Whether it’s live product demos, keynotes, customer testimonials, or interviews with industry insiders - take more photos and record more videos than you think you’ll need. From that, you will be able to generate tons of content ideas spanning from simple picture quotes to infographics, presentations and bite-sized videos. Releasing bigger content pieces like an eBook (that answers people’s biggest questions and pain points) to coincide with your trade show appearance is a great way to demonstrate expertise. Publishing everything on your blog or event specific landing page will boost website traffic. If your whitepaper or eBook is offered as gated content, you are now collecting leads in addition to sharing your voice. Year-round efforts of combining social media and event marketing boosts clickthrough rate across social media platforms 236%. Follow the 80/20 rule where you talk about others 80 percent of the time. Don’t forget industry bloggers. If they blog about you, reporters who cover your space will find you. What are some of the challenges and issues most frequently encountered by your trade show management team? The post-show gameplan wraps up your trade show activities and is focused on follow-up and results measurement. This section touches upon the three main activities required to determine overall success. By the end of it, you will have learned how to prioritize follow-up, measure what worked and what didn’t, and plan for next year. Strategic follow-up activity involves the proven techniques of lead qualification, nurturing and consistent ongoing communication. Not only is follow-up key to maximizing event ROI, it’s also an investment that can pay dividends for years to come. Every exhibitor has someone to follow-up with after a trade show. It could be potential customers, trade show attendees, people who entered your raffle or simply journalists in your industry - the important thing is that each group hears from you no later than 5 days following the show. At the heart of the follow-up plan lies the question: what do you want from your leads? Do you want them to attend an event, download a whitepaper or simply buy from you? By designing your follow up process at the early planning stage, you can make sure you have the right tools and resources in place for the best returns. Gather all your prospects in one place, preferably your CRM. It is quite normal to return from a show with a ton of unorganized lists collected via business cards, badge scanners or exhibitor email lists. All you need to do is put everyone in one spreadsheet. Next, give them an event tag on your Marketing Automation or CRM platform. This will help you automate follow-up campaigns, monitor performance and have a traceable referral source when they convert. Prioritize and allocate leads by scoring them (A-Hot, B-Lukewarm, C-Cold) and organizing them into separate lists for distribution amongst your sales team. Depending on the value of a lead your team might want to either jump on the phone immediately or drop them into an email nurturing campaign, which is just a series of emails until they are ready to convert. For leads whose status is unknown (ex: lead list from a speaking event), an initial qualification* phone call or email might be required before you can properly segment them. *If lead generation was your sole objective, contacts gathered via a lead capture app would have already gone through qualification. But others might require you to do it after the show. Use the same qualification criteria you used on the trade show floor to evenly score your leads. Design a personalized follow-up campaign for each lead list. If sales is your objective, all leads should be inserted into your existing sales funnel at the appropriate stage. If they are lukewarm prospects, assign them to an email nurturing campaign. If they are cold, add them to your monthly newsletter campaign with an option to unsubscribe. Send the influencer list an email with guest blogging and content partnership ideas. Email the attendee registration list (those who attended the show but did not visit your booth), your special promotional offer. Whatever your campaign goals, you should use follow up communications to build relationships with people in your industry. Approximately three months after the show ends is when you should conduct a final post-show wrap up for management. If sales was your objective, have managers follow up with all the sales reps who were given leads. What is their status? How many have closed? How many are successfully moving down the sales funnel? How many are dead in the water? How do the sales projections look? Ideally, sales and marketing will continue to review results up to one year after the show, depending on the length of your sales cycle. If lead generation was your main objective for the show, you should calculate your cost per lead at this stage. If you spent $30,000 to exhibit at a show and you generated 1000 qualified leads, then your cost per lead is $30. More often than not, the company that follows-up first is the one that gets the sale. Always remind leads of who you are, and refer back to your notes to make the communication personal. While traditionally a B2B approach, lead nurturing can be applied to B2C as well. For nurture campaigns, a good rule of thumb is to send communications every 2-4 weeks. Ranking each trade show by the Cost-Per-Lead results is a good decision-making benchmark. 80 percent of sales require 5 follow-ups. Treat leads as people, not targets. Don’t be afraid of reaching out too quickly. You won’t have an exact determination on ROI until all potential leads are accounted for. Data will help you make informed decisions about which trade shows to continue and which ones to cut. Always measure success by whatever objectives you set when you started your trade show planning. Everybody has a different idea of what measurement means. Certainly, your own sales and marketing departments may have varying definitions when it comes to metrics such as leads and opportunities. What is important is that all parties come on board and agree on a common set of definitions and expectations. The result is not only better reporting, but a reliable approach to performance evaluation and measurement. There are many different ways to determine how well you performed, each of them varying in complexity. Was your trade show objective solely to generate leads? Or was it to build relations with existing accounts? How you calculate post-show success ties back to the objectives you set out to achieve when you started your trade show planning, and the related data points you set out to track. If website signups were a goal you would have tracked signups on your CRM or Google Analytics. If social media engagement were a goal you would have tracked data related to shares, likes and follows. Whatever your overall goals, at the very least, you should measure these three metrics. ROI compares the costs associated with exhibiting in a show to the actual revenue generated. Calculating ROI can be simple or difficult, depending on the length and complexity of your sales cycle. Because it could take months before leads evolve into actual sales, you should tag them in your CRM to evaluate actual ROI. 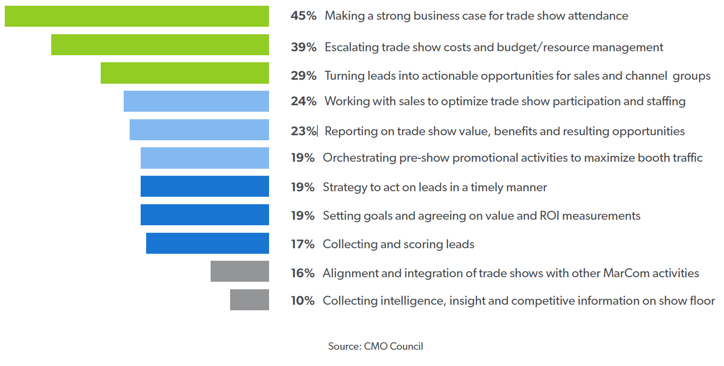 Here are two of the most common metrics used to track trade show ROI. The expense is divided by itself because ROI is expressed as a percent Ex: If you spend $30,000 to generate $45,000, you’ve achieved a 50% ROI. This formula calculates leads converted to sales. Ex: If you made 10 sales from 50 leads gathered at the trade show, your sales to lead conversion rate is 20%. ROO gauges potential opportunity. It is easier to calculate as it involves non-financial performance measurements based on marketing and sales objectives. Here are some common ROO measurements. Customs, labor, travel, entertainment - even the most carefully planned budget might run into uncertainties and get buried in a lot of places when it comes to trade shows. Start by calculating your total investment in the show - easy if you kept track of all of your costs in one place using a budgeting spreadsheet. The spreadsheet will also let you see variances for each line item. This will give you a clear picture of where the money was spent and is extremely helpful when planning your next show. Once you have calculated actual costs (and how close it was to your estimated budget), compare your investment with your ROO and weigh it against the opportunity cost of not exhibiting at all. The average ROI target is three to five dollars in return for every dollar invested. ROI on leads collected can also come from incremental business from existing customers that can be attributed to the trade show. 84% of consumers repurchase the product promoted at the event, after their first purchase. The biggest mistake is not thinking about ROI in the planning stage. You can only track what you’re set up to track. Calculate customer lifetime value (CLV) in addition to ROI to determine the true value of a trade show lead. Managed properly, the results yielded from a planned post-show follow-up campaign will more than justify the effort. Developing and implementing a feedback program will provide you with vital information you need for making key strategic and tactical decisions at future events. Plan to solicit feedback from everyone you came into contact with during the show. Your objective is to gather intelligence and find out more about the things that happened at the show that you may have completely missed. Often constructive comments originate from the most unlikely sources so don’t rule anyone out. Timing is key - it is important that feedback is collected as soon as possible when returning from a show, while your brand and the event is still fresh in everyone’s minds. Post-show feedback can be conducted in a number of ways. Sometimes it’s a quick phone call, other times an email, or even an online survey. Whatever you choose, start by reminding people of who you are. As much as you want to believe you made a connection, it’s tough for people to remember everyone’s name after the show due to the sheer volume of interactions. Booth Visitors - What were your main reasons for visiting the show? How did you first hear about us? What drew you to our booth? How would you rate our display compared to others? Was our signage visible? Were our staff friendly and helpful? Were the contests fun? Was our giveaway valuable? Did you try our product? How likely are you to purchase from us in the future? Overall were you satisfied with the event? Would you return next year? Prospects - Were our pre-show promotions effective? How would you rate our exhibit? Were there enough (or too many) people in the booth? Did our demos and brochures answer all your questions? Were you able to speak to the people you wanted to? How would you rate us against our competitors? How likely are you to purchase from us? Existing Customers - Was our booth location good? Was the size appropriate? Were there enough (or too many) people in the booth? Did we send the right people to represent us? Were the right products and collateral on display? Were our demos educational? What was the most valuable thing you learned by attending? What was your favorite keynote? Would you recommend we attend other trade shows? Show Organizer - How would you rate our planning and preparations? What did you think of our exhibit? Did we pick the right vendors for the job? How could we have achieved our objectives better? Can you share some success stories from other exhibitors? What can we improve in the future? Do you have a money-saving tip you can share? Show Vendors, General Contractors - Were our packing instructions clear? Did we do a good job arranging shipping and drayage? Were our representatives always available? What can we do better next time? Do you have a time or moneysaving tip you can share? Fellow Exhibitors - How would you rate attendance this year compared to previous years? What was the most valuable (and least valuable) part of the show for you? Is there a big takeaway you can share? AD/PR/WEB/SEO Agency - What is our competitors ROI/conversion? How was ROI/conversion calculated? How could we have improved our numbers? What were our best performing (and worst performing) tactics? What channels (or keywords) brought in the most valuable ROI/conversions? Booth Staff - Did the technology work as advertised? Did we make the right layout decisions? Did we choose the right vendors? How efficient was the lead capture process? How would you rate your pre-show training? How would you rate your accommodations, food and travel? How would you rate the performance of your colleagues? How would you rate the performance of your manager? Did you enjoy your time on the trade show floor? What bottlenecks did you experience? How can we make it better for you next time? Do you think we achieved our objectives? Management Team - Did we achieve ROI/ROO? By what margin did we exceed our estimated budget? Should we attend the same show next year? What should we do again, and why? What didn’t work, and why? How can we improve goal setting? How can we improve forecasting and budgeting? How can we improve exhibit performance? How can we improve at-show execution? How can we improve post-show measurement and reporting? A good rule of thumb is to keep your surveys to eight or fewer questions. 64% of marketers used postevent surveys or interviews to help gather data for postshow reports. Not writing a post-show report that evaluates strategy, results, budget, and plans for improvement. Some shows hire professional companies to audit and evaluate the trade show. Ask the show organizer about receiving this report to compliment your own research.